Persepolis, The Walking Dead, Essex County, Maus. Contrary to common belief, modern day comics don’t have to be in colour to be “good”. Like everything, deciding whether or not your comics should be in colour involves a number of trade-offs to consider. Often times, black and white is seen in darker, more gritty comics but this is not always the case. The action comedy Scott Pilgrim had major success in black and white (though a colour version was later released). Black and white can be used to put extra emphasis on the linework. Colours give the reader a lot to absorb and thus take attention away from the art itself. In colourless comics, the shapes and patterns of the linework are front and center. This can be used to emphasize the body language of characters by really showing the curves of the body. 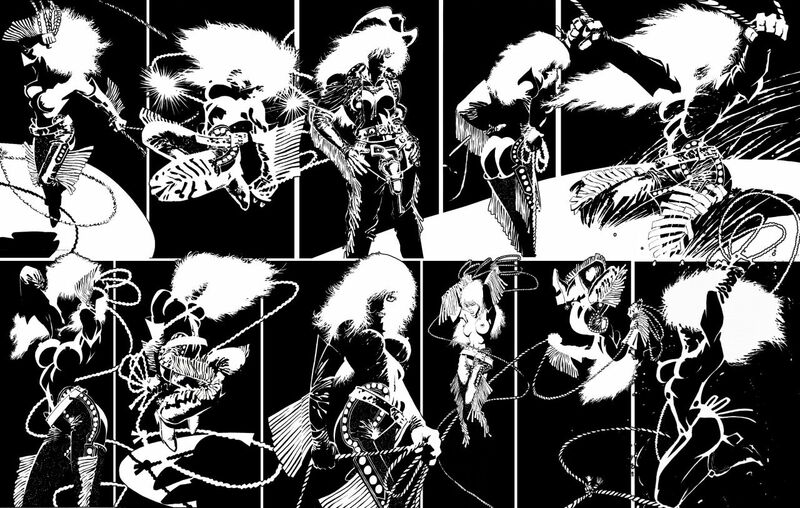 Look at this page (NSFW) from Sin City. 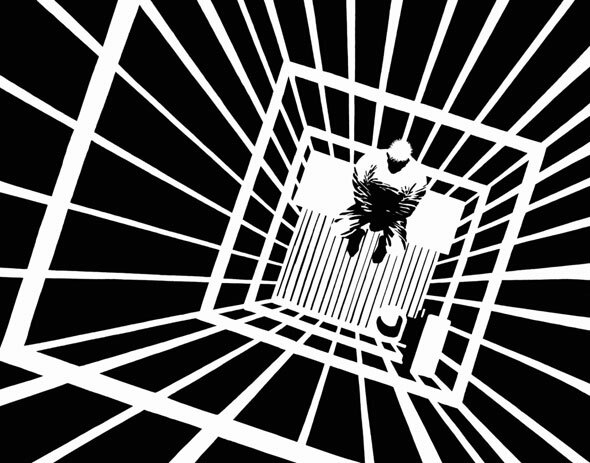 Patterns and leading lines become far more prominent in black and white. The intense direction we get from this page just wouldn’t be as impactful in colour. Black and white comics can have more prominent lighting and shading. With black and white you can really up the contrast in your pages. This works similarly to the previous point as it can really show off the shapes of things. It can also amplify the emotions of a character or scene. Check out this video by Strip Panel Naked which explains this point in depth. The art can be melded together. Without colour, page depth becomes less prominent. The foreground and background start to blend together into a single layer, becoming one, larger image. This results in more abstract or stylized environments. This is super useful when creating more poetic or surreal stories like Epileptic. It’s way cheaper! I’m not really an advocate for choosing something because it’s cheap but printing black and white really does cut down the costs pretty significantly. ESPECIALLY if would have had to hire someone to do the colours. Lots of creators start their comics as black and white, and colour them later once they’ve made some money. Make sure your inks are in at least 600 dpi. Printing in colour usually (depends on the printer) requires a maximum of 300 dpi pages. This is because on printed pages the colours will bleed into each other, slightly blurring the image so printing at a higher dpi wouldn’t produce better results. This isn’t the case with black and white comics (which only print with a single colour), so you’ll want your art to be even higher resolution to keep it crisp. This isn’t a massive deal though so if you’re already finished some pages at 300dpi, don’t stress about it and try to convert them to 600. Most people won’t notice. Ensure your whites are true white. A lot of the time if a comic page isn’t colour corrected before going to print, the white sections of the page can come out as slightly gray. This is especially true for physical, scanned in pages. Make sure your whites are true whites by setting their CMYK or RGB values to zero before printing your pages. This holds true for coloured pages as well, but is more noticeable in black and white. Stick to true blacks and make sure your K values are at **(or close to) 100%. ** I’ll go more into detail about pure vs true blacks later but essentially: when printing, pure blacks use all the tones (CMYK) while true blacks only use K. Because you’re printing black and white, you won’t have any CMY tones so make sure your art is pure K. Note that your art will be slightly gray because of this (only by combining with those other tones can you get that true black) but this is normal for black and white comics. This also produces the cleanest lines since there’s less ink on the page.